The beta site marks an important milestone in the progress of the 3R Project, but it does not represent the completion of the 3R Project. 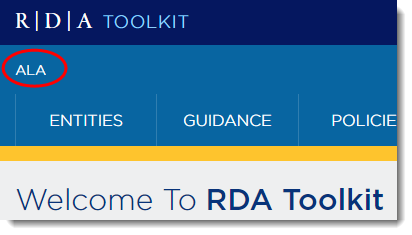 For full description of what you will and will not find on the Toolkit beta site see "What to Expect from the RDA Toolkit Beta Site" and the report from the Chair of RDA Steering Committee "Outcomes of the RDA Toolkit Restructure and Redesign Project". The beta site will be available to everyone with a subscription to RDA Toolkit. If you do not have a subscription , you can sign up for a free 30-day trial which includes access to the beta site. The beta site is accessible from a link in the left column menu of the rdatoolkit.org site and through a link in the top banner of the access.rdatoolkit.org site. Logging into the beta site is separate from logging into the current toolkit.You will have several options for logging in. IP authentication -- just as with the current site if you have IP authentication set up for your account, you will be automatically logged into the Toolkit. IP authentication will not log you into your profile. Your institution's name will appear in the left portion of the top banner, even though the login box still appears. You are able to click on items in the navigation menus or enter a search and access the RDA documents. You can use the login box to log into your profile. Account Username and Password -- just as with the current site, you can use your subscription Account ID and password to log in. The result of this login is the same as that of the IP login. It will not log you into your profile. You will know you are logged in by the same signs listed above. Profile Username and Password -- this login is new with the beta site. You can use your profile login to simultaneously log into the site and your profile. You will know you are logged into the site and your profile because the login box will disappear, and you will see welcoming you by name. This single login simplifies the login and should make offsite access a bit easier. However, it does come with some new requirements. Usernames and passwords will be case-sensitive. Usernames must be unique. This requirement will cause some problems as the profile database has a number of duplicate usernames. If you have a profile username that is a duplicate you will see a message (shown below) informing you of the issue. If you get this message please contact us at rdatoolkit@ala.org or click on the RDA Toolkit Support Center link, and we will correct the issue as quickly as possible. If you don't have a profile, set one up. Just click on the Profile button in the right side of the top banner (shown below) and select Create Profile Account from the menu. We are eager to hear your thoughts on these important and substantial changes to RDA Toolkit and RDA. Please feel free to share thoughts, suggestions, questions about the beta site features, navigation, search, and functionality, as well as about the RDA instruction content and presentation. You can access a feedback form by clicking the Submit Feedback button in the top right corner of the window. While we are open to feedback on all aspects of the Toolkit beta site, please refrain from reporting broken links (which are unfortunately more common than we would like). We get regular reports on broken links and are presently working to correct them. The RDA Steering Committee, members of RDA working groups, the staff at RDA Toolkit and the developers of the Toolkit sites have worked diligently in the past year plus to advance the usability and value of RDA and RDA Toolkit. We hope that you will continue to be patient with us as our work continues and provide constructive feedback that will lead to a better site for Toolkit subscribers.